As mentioned in Part 1 of this series, we love our festival days for the joy, community, and mischief they imbue into our Spring and Fall Plant Sales. The festival days are characterized by the presence of many outside vendors selling their wares or sharing their knowledge and passions. Part and parcel with these intriguing guests come free mini-workshops. At 30 minutes a piece and held outside, these mini workshops are easy to drop into to listen and learn. The final, and crucial, element of our festival days is the presence of live music. So who are these vendors and how were they chosen? A complete list of the 2019 Spring Plant Sale vendors is included at the conclusion of this article and also available in the ‘About’ section of the Spring Plant Sale Facebook event. Most of the vendors ask to be a part of the fun and still others are invited. Many have been selling at our plant sales for years. We strive to hit a beautiful and eclectic balance between artisan crafts, other garden plants, natural body products, farm products, educational booths, and food and drink. Recognizing our festival is small in the grand scope, though it feels enormous to us, we also strive to minimize competition between vendors. Therefore, we choose to have only one person selling handspun yarn, for example. Each and every vendor is passionate, knowledgeable, and looking forward to meeting you. The free mini-workshops are an opportunity for our vendors to share or show, briefly, one aspect of their craft with visitors. It is also an excellent time for visitors to ask questions and dig deep on topics. Each mini-workshop is held only once for 30 minutes. Saturday’s offerings begin at 10am with ‘All About Hemp’ and occur every hour on the hour through ‘What the Cluck?’ at 1pm. Sunday’s workshops begin at 11:30am with ‘All About Soy Candles’ and conclude with ‘Elevated Gardening’ at 1:30pm. Setting the tone for all this hootenanny are a passel of visiting musicians, lending their time and skill for making music worthy of boot stomping, hooting, and hollering. 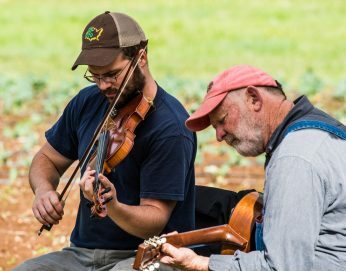 What’s time spent on a farm without a little fiddle or acoustic guitar? This spring we invite back some favorites and welcome new friends. Each set is one hour and Nick Williams kicks the shindig off at 9am on Saturday followed by Sharla June at 10:30, Laura Walker at 12 noon, and Ariel Omarzu wraps up the day with her set at 1:30. Sunday, come clap your hands to Craig Hendricks at 11:30am followed by The Bluebelles at 12:45. We find live music stirs our souls. Help us appreciate and celebrate these artists the first weekend of April. Crabtree Farms is just one member of a larger community and we love bringing folks together to laugh, learn, and garden.